Department of Pharmaceutics 1, SGT College of Pharmacy, SGT University, Budhera, Gurugram - 122505, Haryana, India. Department of Pharmaceutics 2, Noida Institute of Engineering & Technology, Greater Noida - 201306, Uttar Pradesh, India. ABSTRACT: The low bioavailability of drugs in the oral drug delivery system is the main concern and the development of a delivery system with a controlled release profile. 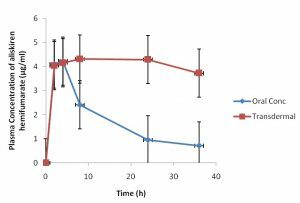 This research aims in the dose reduction of aliskiren hemifumarate, evaluate the release efficacy of the drug from the patches by using various permeation enhancers. FTIR studies established the drug and polymer compatibility. The transdermal patches were prepared by using a solvent casting method using different polymers and permeation enhancers. The keshary chein diffusion cell was used for performing in-vitro permeation studies. By physicochemical parameters and in-vitro release pattern, the formulation made from MethocelK 15M (1:1.5) was selected for in-vivo studies. The steady plasma concentration was observed on application of developed transdermal patches, as confirmed by bioavailability studies in rats. The bioavailability was also improved as compared to oral administration. The SEM studies of transdermal patches show that the patches prepared with MethocelK 15M with cineol as penetration enhancer exhibited the uniform distribution of the drug. The hypertension was induced in rats using dexamethasone and treated with oral administration & application of the transdermal patch. The patches significantly controlled hypertension from the first hour. The stability studies indicated satisfactory performance as evaluated for assay & description on storage for six months. Conclusion: The developed transdermal patch exhibited therapeutic superiority over oral drug delivery. INTRODUCTION: The oral bioavailability of aliskiren hemifumarate is low due to poor absorption of the drug. The obstacle may be overcome by designing different systems for the delivery of drug. The drugs can be delivered by an alternative pathway that is transdermal route 1. The advantages offered by transdermal route over oral administration, such as improved compliance in a patient, avoid first-pass metabolism, constant drug delivery in the body, maintained a constant & prolonged plasma level, minimized the variability in the patients and therapy terminate as and when required 2, 3. The molecule aliskiren hemifumarate is selected for the treatment of hypertension due to its low bioavailability after oral administration. The half-life of the drug is between 23 to 36 h. The unchanged drug excreted in the urine is less than 1%, and some amount also excreted in the feces. It is hydrophilic having a partition coefficient between octanol: water is 2.45 at pH 7.4 with high aqueous solubility. The molecule exists in its free base (pKa = 9.49) 4-8. It is having ideal characteristics such as low molecular mass, poor oral bioavailability, smaller dose & favorable logarithmic partition coefficient for formulation as a transdermal patch. The main objectives of the study included (1) reduction of the dose of the drug and enhancement of the bioavailability; (2) the developed patches were subjected to release rate and in-vivo performance studies, and (3) characterization of transdermal patches efficacy in hypertension-induced rats. The delivery of a drug across the skin exhibits controlled rate & it results in the longer duration of action through patches 9-12. The transdermal patches were designed using various grades of polymers, plasticizers and penetration enhancers. By physicochemical parameters, the best formulation was selected for further studies. Preparation of Transdermal Patch: The drug was received as gift sample from Dr. Morepen, methocel from colorcon Mumbai. The remaining excipients like penetration enhancers & solvents used in the study were of analytical grade (Sigma Aldrich, Alfa Aser) and obtained commercially. The solution for preparing transdermal patch was prepared by dissolving methocel in a mixture of chloroform: dichloromethane: ethanol with the help of magnetic stirrer. The mixtures of solvents & polymer were prepared by slowly adding drug followed by propylene glycol as plasticizer & cineol as a permeation enhancer and mix properly to get the uniform solution. Evaluation of Transdermal Patch: The best formulation was selected by physicochemical properties and was subjected to further studies 13. Physicochemical Compatibility of Drug and Polymer: The Fourier Transform Infrared (FTIR) spectra for aliskiren hemifumarate and polymer were recorded and used in evaluating the physical & chemical compatibility. The KBr pellets were prepared with pure drug, polymer & mixture of the drug with a polymer to record the spectra. The samples were scanned at a wavelength of 4000 to 400 cm-1 & spectra were recorded. Spectra of the pure drug, polymer, and mixture of the drug with polymers were evaluated 14-15. Morphology: The uniformity of drug distribution in patches was assessed by scanning electron microscopy (S3400 Hitachi, JAPAN) 14-15. In-vivo Studies: The Wistar albino male rats weighing between 200-220 g were used for in vivo studies. The animals were procured from the animal house of the Innovative Institute of Pharmacy (Greater Noida, Uttar Pradesh) Registration number: 1346/PO/Re/S/10/CPCSEA dated 16/06/17). The approval for the project was taken from the Institutional Animals Ethics Committee. The rats for the study were housed in standard lab conditions i.e. 24-26 ºC and 50 to 60% relative humidity with a 12-h alternate light/dark cycle. The rats were kept in stainless steel cages, with accessibility to the diet and water. The rats were selected by a superficial examination of the surface skin for abnormalities. Dorsal side of rats was trimmed to about approximately 6 cm2. The rats were kept fasted during examination (24 h) to check the untoward effect of shaving. The plasma samples were withdrawn at different intervals of time, i.e. 2, 4, 8 and 24 h using a lateral tail vein method. Plasma samples were separated by centrifugation (Remi, RM-12C, micro-centrifuge) and kept in Eppendorf tube at -70 ºC. The Reverse Phase analyzed the concentration of drug in plasma - High-Performance Liquid Chromatography (RP-HPLC) validated method. The Instrumentation for HPLC; Column: Capcell PAK C18, Column length: 250 mm × 4.6 mm i.d., 5μm, Detector: UV-Visible detector, Column temperature: ambient, Flow rate: 1.0 ml/min, Mobile phase ratio: acetonitrile: methanol: pH 3.0 buffer (20:50:30 (v/v), Injection volume: 10 μL & retention time: 6.43 min 15-18. Transdermal Patches Efficacy in Rats against Hypertension: The blood pressure (BP) was measured using measuring instrument (BIOPAC NIBP 200 A) with a tail cuff (non-invasive) and a digital BP instrument. The BP was measured by using BP measurement & holding rats in rat holder. The initial BP of rats were found to be normal, dexamethasone (20 µg/kg/day subcutaneously) was injected for 14 days to induce hypertension. After two weeks of induction of hypertension in the rats with a minimum mean BP of 150 mmHg were selected. Rats were divided into 3 groups (n = 5). Group, I marked as control, group II treated with drug 5 mg/kg orally, group III treated with a transdermal patch of the drug. Blood pressure at the different time intervals (2, 4, 8, 24 and 36 h) was observed 16-19. Skin Irritation Test: The dorsal side hairs of the albino rats were shaved, one day before the commencement of the experiment. The rats were divided into 4 groups (n = 6). Group, I acted as the normal, group II applied with adhesive tape (adhesive tape official as per USP), group III was applied with transdermal patch without drug and group IV was applied with a transdermal patch with the drug. The patches application sites were indexed according to a visual scoring scale, always by the same investigator. The erythema scale was as follows: 0, none; 1, slight; 2, well defined; 3, moderate and 4, severe 20-23. Stability Evaluation: The purpose of stability studies was to ensure that the quality of a product does not vary with time under the influence of temperature & humidity. The stability studies were performed for 6 months on the final transdermal patch. Samples were packed with the backing membrane. The samples (prepared in triplicates and) were kept at 40 ºC/75% RH stability testing conditions, viz - 4-8ºc serving as control and 25 ºC/60% RH (Stability Chamber) as per ICH Guideline Q1A. The essay content and ex-vivo penetration studies were performed at each sampling point 19, 23. FT-IR Spectra Analysis: The infrared spectral analysis of the drug showed principle peaks at wave numbers of 2932.66, 2969.47, 2875.29 cm−1, which can be attributed to the C-H stretching (asymmetric) vibration of drug and also exhibited the bands at 1306.24 cm−1, 1425.59 cm−1, 1445.15 cm−1 & 1515.86 cm−1, due to as (C-O). The presence of two bands at 1609.29 cm−1 and 1664.08 cm−1 possibly due to C =O. The amine group shows stretching at 1565.98 cm−1. The bending vibrations of methyl & methylene groups present at 1236.03 cm−1 and 1258.99 cm−1, respectively. The spectra ensure the purity of the drug as per established standards. In the IR spectra of the mixture of drug and polymers, the major peaks of the drug were noted to be at same wave numbers. The additional peaks were observed in mixture, due to the presence of polymers. Morphology (SEM): The principle of the SEM study was performed to study the surface morphology of the formulation. The results showed that the drug is uniformly distributed in the patches as shown in Fig. 1. 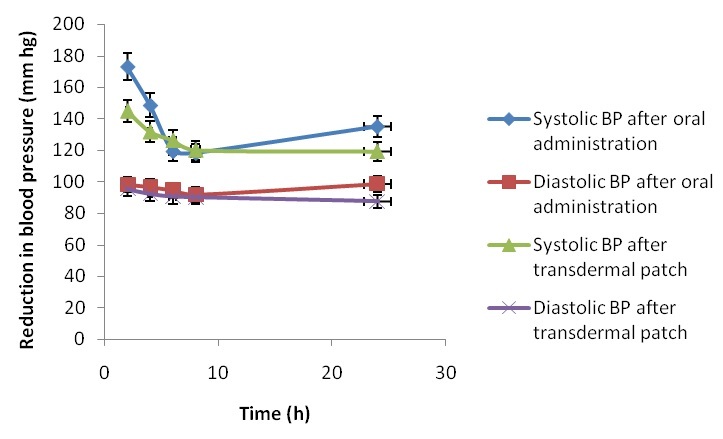 In-vivo Comparison between Single Dose & Transdermal Patch: Table 1 showed the amount of drug recovered from plasma at different time intervals. The graph between plasma time concentrations curves upon single patch application, for 24 h at a various time interval of absorption of the drug. The comparison was made between monitored pharmacokinetic parameters at all time points. The AUC shows the drug absorption in the body; it was an estimate of dose proportion as shown in Fig. 2. The absorption increases with the increasing concentration in the formulation. However, no such affinity was seen when ex-vivo permeation studies performed using rat skin. 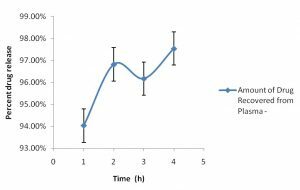 Assessment of Pharmacokinetic Parameters on Animals using Patches: The plasma levels of the drug were compared after transdermal and oral administration. The concentration maxima after oral administration were found to be 4.23 ± 0.31 μg/mL, and Tmax found to be 4 h. All the pharmacokinetic parameters obtained with the transdermal patches were significantly different as compared to oral administration. 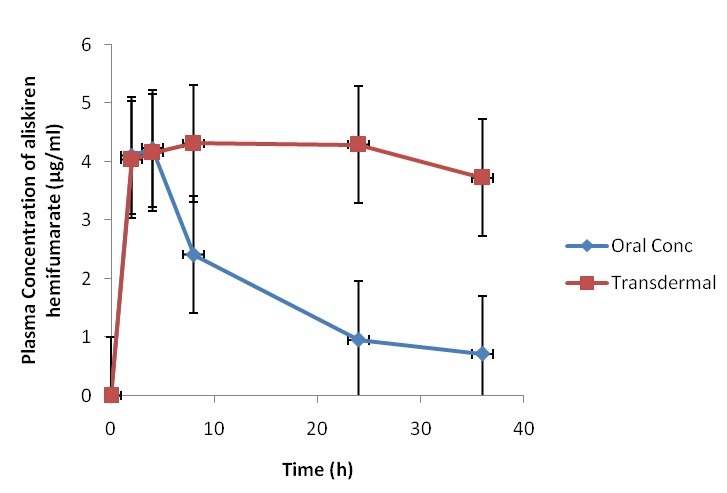 The results indicated that the elimination half-life of the drug was prolonged by the transdermal patches (19.9 ± 0.24 h) in rats as compared to oral administration (6.75 ± 1.82 h). This will result in longer duration of action. The transdermal patches show a lower elimination rate. The anova single factor shows the p-value of less than 0.5. The significantly high area under curve values observed with transdermal patches also indicates increased bioavailability of the drug from patches as compared to oral administration. The bioavailability of the drug was found to be enhanced with the patches. In-vivo Efficacy in Hypertensive Rats: The treatment schedule for the different groups provided in Table 2. As shown in Table 3 the results indicate that significant hypertension can be induced after administration of dexamethasone. The hypertension was initially controlled by oral administration, with the maximum effect observed at 6-8 h, but later on approximately 8 h the BP started rising gradually. In contrast, the hypertension is well controlled by patches with an initially gradual decrease in BP but effects remain for a longer duration as compared to oral administration. 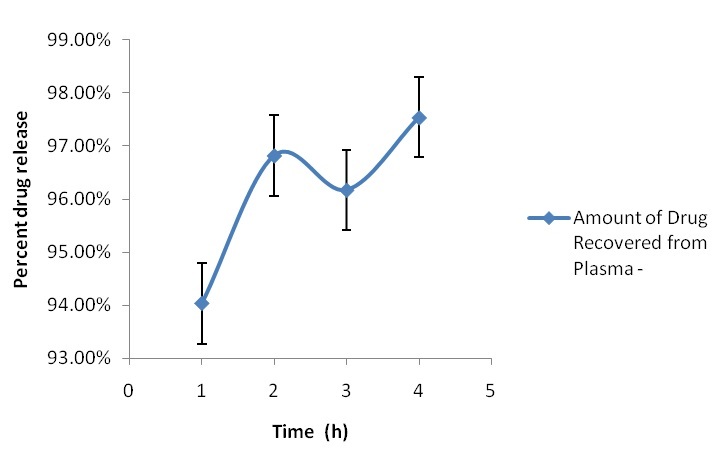 The patches maintain the continuous plasma level from the first hour and the effect continued for 24 h. It resulted in prolonged control of hypertension for 24 h. Since, transdermal patches of the drug resulted in prolonged drug release for 24 h. Thus it is clear, that the prepared patches can overcome the problem of the oral administration such as poor bioavailability, & more first pass metabolism. Skin Sensitivity Test: The skin irritancy was assessed by applying the transdermal patches to the skin & calculating the score (erythema and edema) of less than 2 Table 4. The formulation showing scores of 2 or less were considered negative (no skin irritation) according to Draize et al., on that basis, it was decided that the developed transdermal patches are free of any skin irritation. Stability Evaluation: The stability studies were performed as per ICH guidelines Q1A (R2) at accelerated conditions at 25 ºC/60% RH at long term & 4 ºC-8 ºC under refrigerated conditions. The assay was determined for the drug from stability samples. The samples were prepared in triplicate (at 3 concentration levels) & placed at different stability testing conditions as per guidelines, viz. 4–8 ºC is serving as the control and 25 ºC/60% RH (Stability Chamber, lab India) serving as the test condition. After analysis, the formulations were found to be stable concerning its physical and assay parameters. The permeation enhancer effect was assessed by permeation through the cellophane membrane. The flux and lag time for the drug penetration did not alter significantly during the 6-month long study at all the stability conditions, showing the integrity of permeation enhancer system. CONCLUSION: The developed patches proved their superiority over oral administration. They effectively delivered the drug for a prolonged duration, thus exhibited better control over hypertension. However, further studies are needed to prove their efficacy at the clinical level. ACKNOWLEDGEMENT: I would like to acknowledge department of pharmaceutics, Innovative College of Pharmacy for approving my project through institutional animal ethical committee for in-vivo studies and my Ph.D. guide because without her it has not possible to complete my work. We hereby confirm that we didn’t receive any grant or funds from any agencies. AUTHORS CONTRIBUTIONS: All the authors have contributed equally. CONFLICT OF INTEREST: There is no conflict of interest in this article writing. Oparil S, Yarrow SA, Patel S, Fang H, Zhang J and Satlin A: Efficacy and safety of combined use of aliskiren and valsartan in patients with hypertension: a randomized, double-blind trial. www.thelancet.com 2007; 370(7). Oparil S, Yarows SA, Patel S, Zhang J and Satlin A: Dual inhibition of the renin system by aliskiren and valsartan. www.thelancet.com. 2007; 370(7). Knorr F, Lademann J, Patzelt A, Sterry W, Blume-Peytavi U and Vogt A: Follicular transport route - Research progress and future perspectives. European Journal of Pharmaceutics and Biopharmaceutics 2009; 71: 173-180. Morris AP, Brain KR and Heard CM: Skin permeation and ex-vivo skin metabolism of O-acyl haloperidol ester prodrugs. International Journal of Pharmaceutics 2009; 367: 44-50. Bach M and Lippold BC: Percutaneous penetration enhancement and its quantification. European Journal of Pharmaceutics and Biopharmaceutics 1998; 46: 1-13. Guillard EC, Tfayli A, Laugel C and Baillet-Guffroy A: Molecular interactions of penetration enhancers within ceramides organization: A FTIR approach. 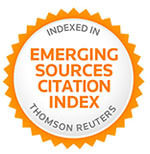 European Journal of Pharmaceutical Sciences 2009; 36: 192-199. Mitragotri S: Modeling skin permeability to hydrophilic and hydrophobic solutes based on four permeation pathways. Journal of Controlled Release 2003; 86: 69-92. Zhao K and Singh J: Mechanisms of percutaneous absorption of tamoxifen by terpenes: eugenol, D-limonene and menthone. Journal of Controlled Release 1998; 55: 253-260. Jain AK, Panchagnula R. Effect of temperature on imipramine hydrochloride permeation: role of lipid bilayer arrangement and chemical composition of rat skin. International J of Pharmaceutics 2003; 250: 287-293. Barry BW: Drug delivery routes in skin: a novel approach. Advance Drug Delivery 2002; 54 (1): S31-S40. Barry BW: Novel mechanisms and devices to enable successful transdermal drug delivery. European Journal of Pharmaceutical Sciences 2001; 14: 101-114. Alkalani AZ, McCrudden MTC and Donelly RF: Transdermal Drug Delivery: Innovative pharmaceutical developments based on disruption of the barrier properties of the stratum corneum. Pharmaceutics 2015; 7(4): 438-470. Sethi B and Mazumder R: Comparative evaluation of selected polymers & plasticizer on transdermal drug delivery system. International Journal of Applied Pharmaceutics 2018, 10(1): 67-73. Bendas ES and Tadros MI: Enhanced Transdermal Delivery of Salbutamol Sulfate via Ethosomes. AAPS Pharm Sci Tech 2007; 8(4): E 107. Aqil M, Ali A, Sultana Y, Dubey K, Najmi AK, Pillai KK: In-vivo characterization of monolithic matrix-type transdermal drug delivery systems of pinacidil monohydrate: a technical note. AAPS PharmSciTech. 2006; 7(1): E38-E42. Akram MR, Ahmad M, Abrar A, Sarfraz RM and Mahmood A: Formulation design and development of matrix diffusion controlled transdermal drug delivery of glimepiride. Drug Des Devel Ther 2018; 12: 349-364. Ubaidulla U, Reddy MVS, Ruckmani K, Ahmad FJ and Khar RK: Transdermal therapeutic system of carvedilol: effect of hydrophilic and hydrophobic matrix on in-vitro and in-vivo AAPS Pharm Sci Tech 2007; 8(1): E13–E20. Le G and Goosens KA: Sampling blood from the lateral tail vein of the rat. Journal of Visualized Experiments 2015; 99: 1-5. Parasuraman S, Raveendran R and Kesavan R: Blood sample collection in small laboratory animals. Journal of Pharmacology & Pharmacotherapeutics 2010; 1(2): 87-93. Hajighahramani S and Vesal N: Evaluation of several drug combinations for intraperitoneal anaesthesia in adult male rats. Iranian Journal of Veterinary Research 2007; 8(2): 106-115. 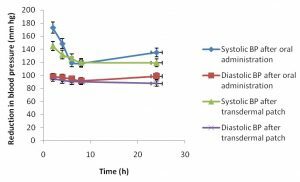 Patel D, Patil RA and Patel A: Antihypertensive activity of Beta vulgaris on dexamethasone-induced hypertension in rats. Pharmaceutical and Biological Evaluations 2017; 4(1): 37-46. Dubey H, Singh A, Patole AM and Tenpe CR: Antihypertensive effect of allicin in dexamethasone-induced hypertensive rats. Integrated Medicine Research 2017; 6: 60-65. Swamy GK, Kumar JMR and Rao JVLNS: Validated RP-HPLC method for the simultaneous determination of aliskiren, hydrochlorothiazide and amlodipine besylate in pharmaceutical formulations. 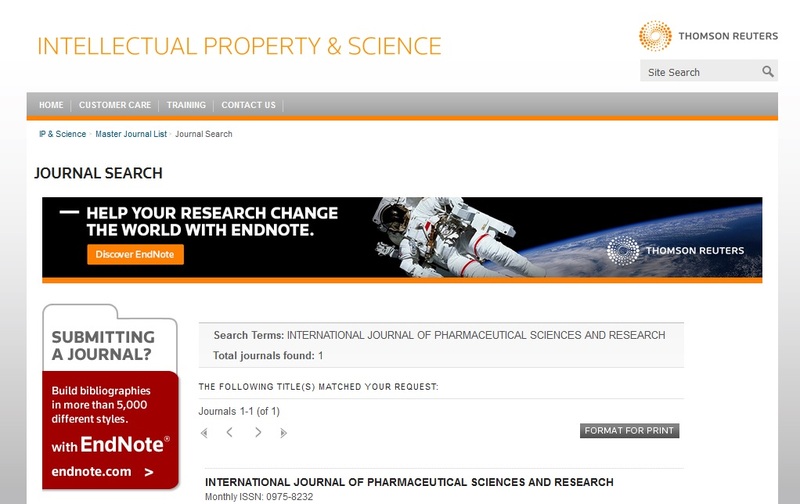 International Journal of Chem Tech Research 2012; 4(04): 166-1673. Sethi B and Mazumder R: In-vivo characterization of transdermal patches of aliskiren hemifumarate for treatment of hypertension. Int J Pharm Sci & Res 2019; 10(4): 1929-34. doi: 10.13040/IJPSR.0975-8232.10(4).1929-34.